Home > Animal Shelter Volunteering > Animal Fostering > Dog Fostering > How do you handle all of those dogs and foster dogs too? 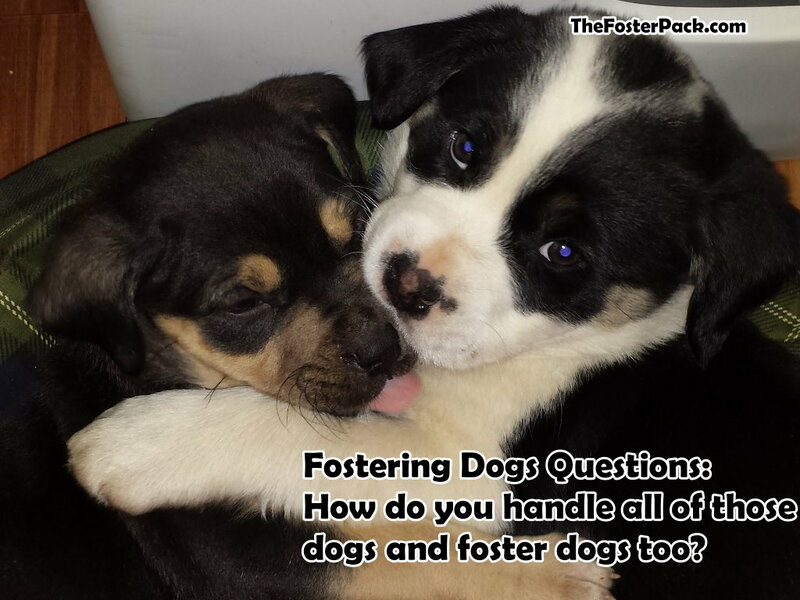 Fostering Dogs Questions: How do you handle all of those dogs and foster dogs too? This would be the second most asked question I get. But don’t let us scare you. Most foster families do not have as many dogs and/or foster dogs as we do. Although most of the foster families we know personally have almost as many. And most of them have cats too, which we can’t due to high prey drive of our Jack Russell Terriers. We handle the dogs and foster dogs: By staying calm. Dogs pick up on your energy. If you get all worked up and upset, they’re going to get all worked up too. Stay calm, they’ll stay calmer. That would be the best way to answer. I’m a stickler with the dogs’ schedules. I plan trips to town and such around feeding times, potty breaks, and playtime. Dogs like routine. And when they know what to expect next, things go smoother. Another way to help handle many dogs and foster dogs: Crates, gates, doors and playpens. I couldn’t do it without them. We have [amazon_textlink asin=’B001OE1PC8′ text=’dog gates’ template=’ProductLink’ store=’fosterpack-20′ marketplace=’US’ link_id=’71755b7f-30e5-11e7-8521-472a87960e56′] on almost every doorway in the house. Most of the dogs have their own [amazon_textlink asin=’B00QAVO29I’ text=’dog crates ‘ template=’ProductLink’ store=’fosterpack-20′ marketplace=’US’ link_id=’85a693b6-30e5-11e7-bc4b-13d2126f0d43′]or bedrooms. Separating helps keep things to a manageable level. Never are all of the dogs in one room at the same time. Exercise. A tired dog is a good dog! Tired dogs are much easier to handle. We encourage our dogs to run outside as must as possible. They have almost 5 acres to play on, we encourage them to run it all every day. We have a path through the woods that marks their boundaries. Foster dogs are walked, usually on the path that marks out our dogs’ boundaries. Or they get put out on the big [amazon_textlink asin=’B0002APK6C’ text=’dog run’ template=’ProductLink’ store=’fosterpack-20′ marketplace=’US’ link_id=’97f1a746-30e5-11e7-9069-65ebd28949ad’] during playtime. Consistently training all of the dogs and foster dogs. Our dogs are definitely not the best-trained dogs in the world. But we work with them constantly and try to stay consistent. Although the Man of the House sometimes has a hard time with this, especially with his little Monkey. We work with the foster dogs too. Having dogs that at least know the basics helps keep things calm. Help from the family and rescue friends. I couldn’t do it without my daughter. She’s the only one who can handle all of the dogs as well as I can. Sometimes she’s even better at it because they don’t velcro to her like they do with me. I also have a wonderful support system from the shelter and rescues I work with. The other foster families, the shelter director, etc. There’s always someone to answer any questions I have. Or to let me vent. I also have a wonderful support system from the shelter and rescues I work with. The other foster families, the shelter director, the rescue founders, etc. There’s always someone to answer any questions I have. Or to let me vent to if that’s what I need. Sometimes I just have to put them all in their [amazon_textlink asin=’B00IGEP52K’ text=’crates ‘ template=’ProductLink’ store=’fosterpack-20′ marketplace=’US’ link_id=’e95168b6-30e5-11e7-89a2-9f16db62cf75′]and take some time for myself. A bath, a walk without dogs. Going out with the family or friends, etc. I can’t be FurMamaMinion constantly.